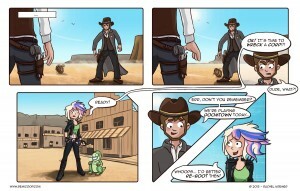 Grab your leather boots and cowboy hat and put on your poker face for Doomtown! Enlarge your influence by buying deeds to take control of the town. Take your dudes and their posse to the town’s square for a shoot out! Doomtown is most surely the only expandable card game in which you play poker and shoot at each other.